We upgraded the ghettoDatacenter to vSphere 5 this weekend and one of the things I wanted to play with was the new VMware VSA (vSphere Storage Appliance). Since we only have a single host, running nested ESXi would be our only option and this would allow us to easily deploy three vESXi 5.0 hosts and vCenter to tinker with the new VMware VSA. UPDATE (09/16/12): You can use the same process outlined in this article to run the new VMware VSA 5.1 (vSphere Storage Appliance) in a nested ESXi configuration. 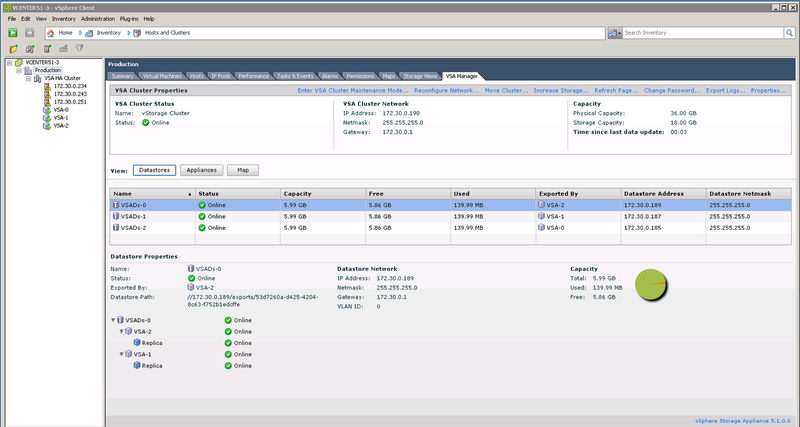 Below is a screenshot of running VSA 5.1 in Nested ESXi 5.1. One caveat in using vESXi hosts to test the VSA is during the selection of your ESXi hosts, VSA expects the hosts to be EVC capable. The VSA will create a vSphere Cluster and automatically enable EVC baseline based on your cpus. As you may or may not know, EVC can not be supported in a vESXi host and this would prevent you from selecting these hosts. Luckily this issue was solved by a Vijay in his blog post here. There is a configuration file called dev.properties located in C:\Program Files\VMware\Infrastructure\tomcat\webapps\VSAManager\WEB-INF\classes which contains a line specifying whether or not EVC should be configured "evc.config". 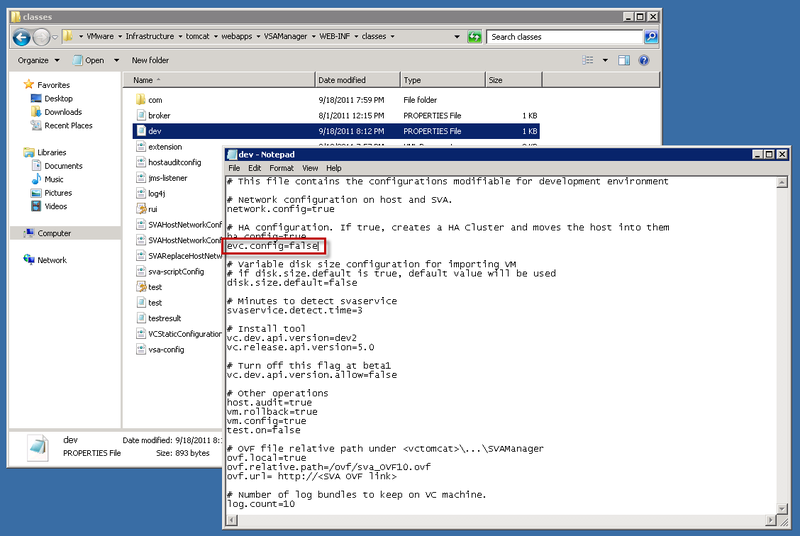 This configuration file appears to be used by VMware internally for some type of development but by changing the parameter from true to false, the VSA will support non-EVC capable hosts and not enable EVC for the VSA vSphere cluster. Note: This is most likely not supported by VMware, please use at your own risk along with modifying any other values within this file. Now, you might wonder if Vijay had already documented this process in his blog, why am I repeating it? Well the issue that Vijay had identified by tweaking this configuration file was that the VSA GUI installer did not detect the change and had to rely on an alternative method of installation using the commandline. Though not ideal, this method does work but for first time evaluators of the VMware VSA, the various commandline options can overwhelm or confuse users. It would be great if one could using the VSA GUI to perform the installation which is much more intuitive and that is reason for this article. For the VSA to detect the new changes, you will need to restart the VMware VSA and then the vCenter Service under the Windows Services utility. I am not sure why both services need to be restarted, but I guess the VSA extension is not updated when just the VSA is restarted which is unfortunate. Once both services have started up, open a new vSphere Client session to your vCenter Server and proceed with the VSA installation. During the selection of the hosts, you will now have the option of selecting your vESXi 5 hosts and a warning message is presented stating "Unsupported Hardware" but the installer will allow you to continue on. 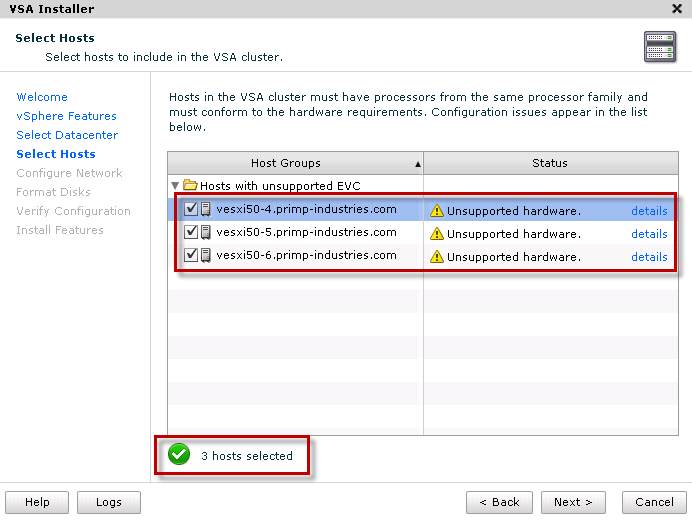 After you have selected either two or three of your vESXi hosts, you will be prompted once more that this configuration is not supported nor in the VMware HCL, go ahead and click OK.
After this, you will be able to go through the rest of the VSA installation as long as meet the default requirements of the VMware VSA noted in the documentation. So if you have some interests in the new VMware VSA and do not have physical hardware to test with, you should consider deploying a couple of vESXi hosts and kick the tires with the new VSA. Excellent post. Will try on physical PE 1950 by creating 2 vesxi – 4 nics and continue with this guide for VSA install. Thanks! 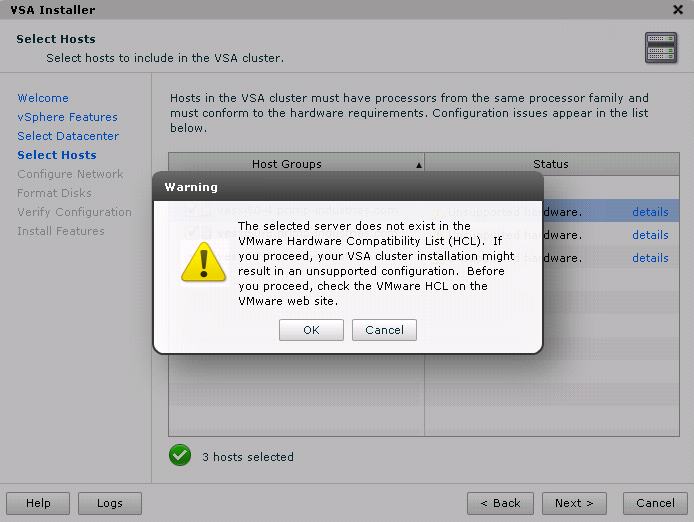 i am stuck at the “select hosts to add to vsa cluster” screen. i have made the required changed to the dev file. my issue is, i cannot tick my hosts, no matter what i try i cant get a tick in th boxes to select my hosts. Good Stuff. I’llgive it a shot this wkend. 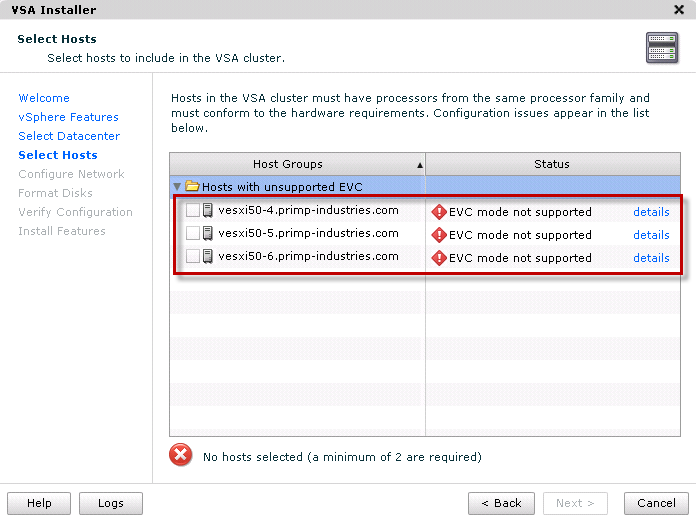 All my hosts are EVC enabled but using VSA is not possible: “Unsupported Hardware – should not be in a cluster”. Behaviour is same-same if I set the parameter to false in dev.properties. How can I get ’round that? Worked amazing, fantastic post. Saved me from having to test this on my new physical hardware. Does anyone know if there is an evaluation key option for VSA? I would really like to try this. Also, how did you meet the hardware requirements for a RAID controller and RAID set? 1) VSA is part of the vSphere 5.1 60-day evaluation. 2) The RAID requirement was not a hard stop. My outer-guest ESXi servers are each set with a single 325 GB SCSI VHD. The VSA Manager didn’t complain about them during configuration. I’m running the three ESXi servers and the vCenter servers under a VMware Workstation 8 system. I did have to reboot instead of just restarting services after setting evc.config to false. I have a problem: I’ve added HDD (second Hdd, first is 3GB) (bigger than 30GB) to nested ESX. VSA Installer is showing message: Unsupported Hardware (available storage is less than 30GB…). Even if I add this HDD as a Storage to ESX still the same message. Please create step by step screen capture for installation of VSA in VMware Workstation. Also, please provide us the details of the VMware Workstation networking (Bridge, NAT, Host only) to be created to make VSA configuration complete.